International Sculpture Day, or IS Day, is a celebration held annually on April 24. IS Day was initiated by the International Sculpture Center to further the ISC’s mission of advancing the creation and understanding of sculpture and its contribution to society. Today, organizations and cities around the world celebrate important works of public sculpture, including right here in Charlotte. The Arts & Science Council updated a current work, Wind Sculpture, created by Jack Pentes in 1986. The sculpture is located on West Trade Street in Charlotte’s Third World. The six spinning discs had faded over time. In conjunction with International Sculpture Day, the panels were replaced by six new circles made of Sunbrella fabric, donated by North Carolina-based company Glen Raven, Inc. The graphic wind screens feature designs by Wray Ward, a local marketing firm. 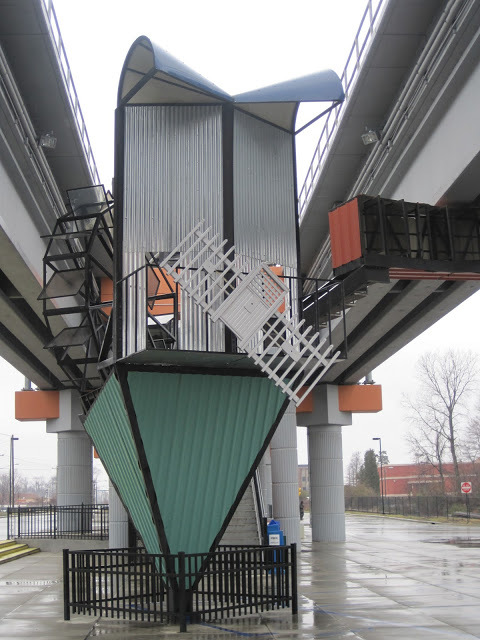 Kudos to the ASC for making this supporting and conserving public art in Charlotte. In honor of IS Day, we are highlighting just a few of the many other special public art pieces in the Charlotte area. Since the 1960s Dennis Oppenheim’s works have been included regularly in international group exhibitions at prestigious venues including the Museum of Modern Art, Centre George Pompidou, the Metropolitan Museum of Art, the Venice Biennale (1976, 1980 and 2001) and Documenta in Kassel, Germany (1972, 1977). Solo exhibitions have included the Tate Gallery, London (1972); the Musée d’Art Moderne de la Ville de Paris (1979); and the Whitney Museum of American Art (1983, 2003). Oppenheim has received numerous prestigious awards including a Guggenheim Foundation Fellowship, two National Endowment for the Arts Fellowships, an Excellence in Transportation award from the State of California, and a Lifetime Achievement Award at the Vancouver Sculpture Biennale. Oppenheim has worked in all media, from action and film, to photography and installation, and has created several public sculptural works. With a resume like that, we ought to be promoting the fact that Oppenheim’s Reconstructed Dwelling resides right here in Charlotte. If you aren’t familiar with this work of art, you should probably head straight to the closest LYNX Blueline Station and get yourself to the Tyvola Station right now! Born in Falenty, Poland in 1939, Abakanowicz is one of the most important sculptors of our time. Her art was influenced by her experiences living in Poland under Nazi and Soviet occupation during and after World War II. Her work has been featured in more than fifty solo exhibitions internationally and she is the recipient of numerous honors and awards, including the Lifetime Achievement Award from the International Sculpture Center. 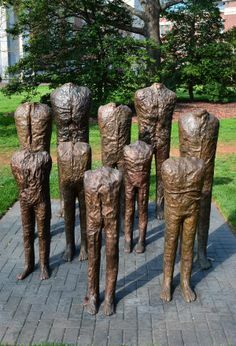 Abakanowicz’s works can be seen around the world, including in the US at Chicago’s Grant Park and the National Gallery in Washington, DC, and, yes, on the campus of Davidson College here in Mecklenburg County. Drop by the Galleries to pick up a sculpture map (or visit their website to download one), and see this commissioned work from 2010 along with other sculptures by internationally-acclaimed artists such as Jaume Plensa, Joel Shapiro, and Antony Gormley. 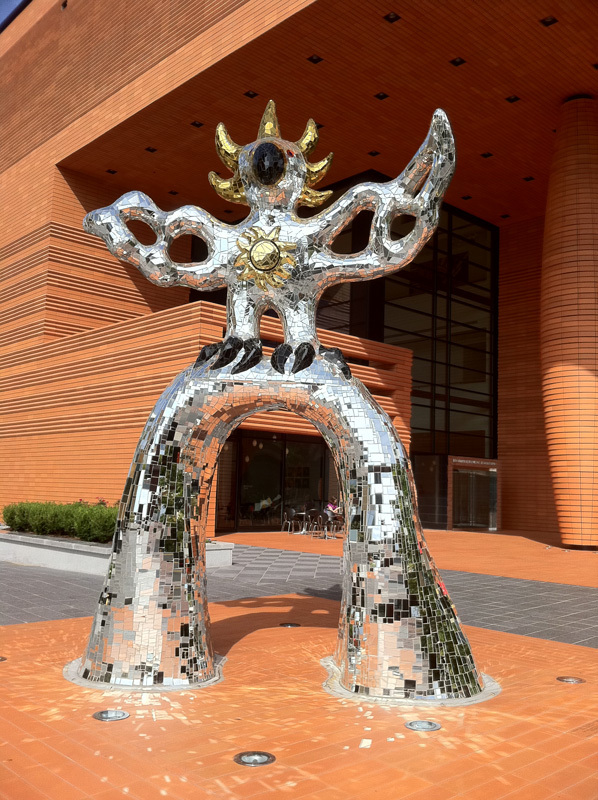 Created in 1991 by French-American artist Niki de Saint Phalle (1930-2002), Firebird, was purchased by Andreas Bechtler in 2009, in preparation for the opening of the Bechtler Museum of Modern Art in January 2010. Standing 17-feet 5-inches tall, the bird-like figure is whimsical, like much of De Saint Phalle’s sculptural works. Covered in mirrored and colored glass, Firebird has become a favorite spot for photos in Uptown Charlotte. Jean Tinguely was a Swiss sculptor (1925-1991) who began experimenting with mechanical works of art in the 1930s. Many associate Tinguely with his drawing machines, the Meta-Matics, from the 1950s, which create abstract works of art through a mechanized process. His constructions, incorporating found objects/junk and kinetics, are often humorous or ironic. 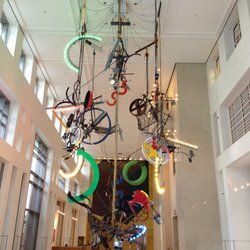 Tinguely’s last sculpture – Cascade – was commissioned by the Bechtler family and resides, yep, you guessed it, right here in Uptown Charlotte, in the Carillon office tower on West Trade Street. The 40-foot motorized mobile is suspended over a fountain in the building’s lobby and is available for you to see, free of charge, on weekdays when the office tower is open to the public.